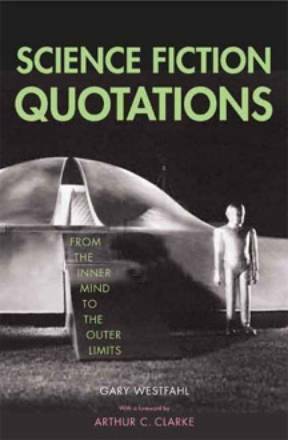 As implied by the title, this is a book of science fiction quotations. The book includes quotes from written fiction as well as from movies and television. Quotes tend to be attributed to the writers, rather than to the various characters who might speak them. Some of the quotes aren’t from stories, but are statements made by various SF authors. If you’re looking for a quote, on a given topic, or by a particular author, this well indexed book will serve you well. The book also makes for an enjoyable read, if you just want to spend a while rummaging through the collection. I confess to not managing to read all 400 pages of quotes from beginning to end in one sitting.